Renowned Republic of Ireland based Prophet and Man of God, Prophet Marcus Korede Oluwatosin Tibetan (The Nostradamus) has commenced the final funeral rites of his mother who passed away couple of weeks ago. The man of God who celebrated the 20th years anniversary and adult harvest of his church Celestial Church of Christ, Elisha Parish (Nigerian Cathedral) last Sunday November 15th in Lagos lost his mother, late Mother Celestial Funmilayo Maria Tibetan (Nee Lajuwomi) on Sunday September 6th 2015 while observing his Church’s annex’s 6th year adult harvest and anniversary in Dublin, Republic of Ireland. Mama passed away at age 80. 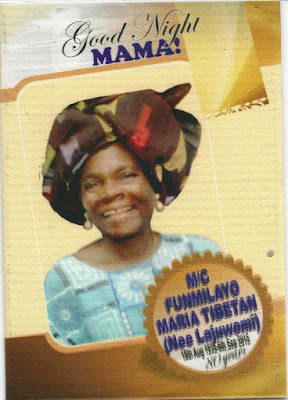 Late Mother Celestial Funmilayo Maria Tibetan will begin her last journey home today, Friday November 20th with a wake keep service at her son’s Nigerian Church cathedral- CCC, Elisha Parish, 1-8 Celestial Way, off Zawiyyat Street, Ajegunle Bus Stop, off Lagos Abeokuta Express Way. The event which promises to have in attendance leaders from several denominations and guests from all walks of life will take place between the hour of 6pm and 8pm. On Monday 23rd of November, Mama’s corpse will be leaving Military Hospital, Yaba Lagos in a Convoy of Cars straight to Ode-Aye for a lying in state ceremony at the Tibetan Family House by Okerisa Street, Ode-Aye. 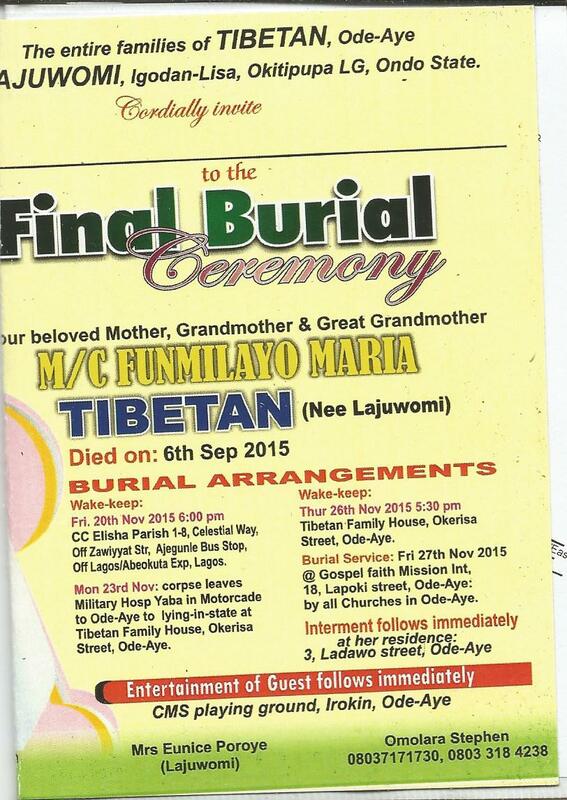 A new set of activities will kick start on Thursday November 26th as Mama begins her final journey home with a Wake Keep Service at the Tibetan Family House, Okerisa Street- Ode-Aye. 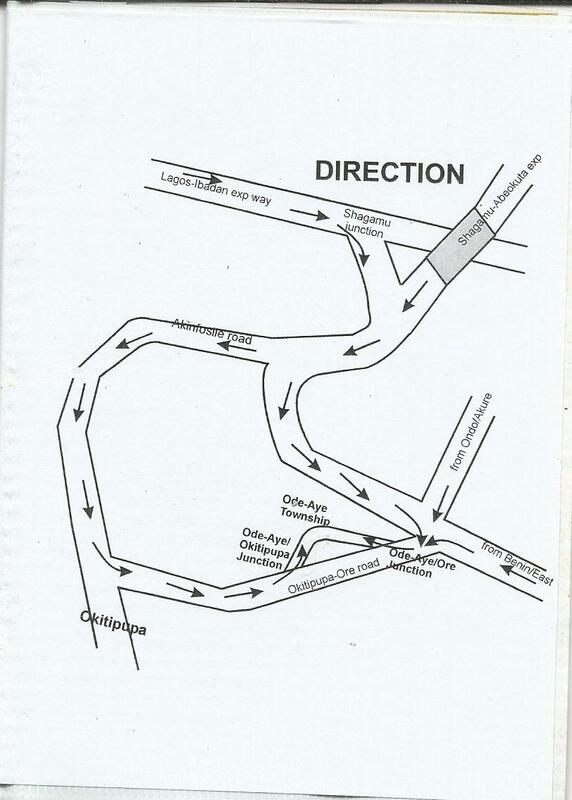 The event will also have clergies from various interdenominational churches to honor Mama as a faith legend of the town. On Friday November 27th, Gospel Faith Mission International, a church Mama was instrumental to its establishment in Ode-Aye will coordinate the final funeral service at their mission house at 18, Lapoki Street, Ode-Aye. 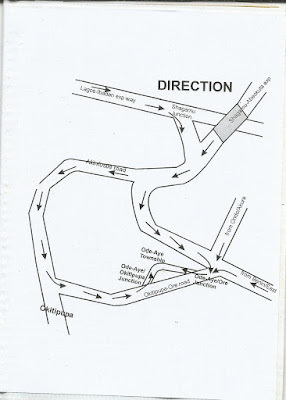 The event will have in attendance all churches in Ode-Aye under Okiti Pupa LGA, Ondo State. Interment follows immediately at Mama’s residence at 3, Ladawo Street, Ode-Aye while guests will be entertained at CMS Playing Ground, Irokin. 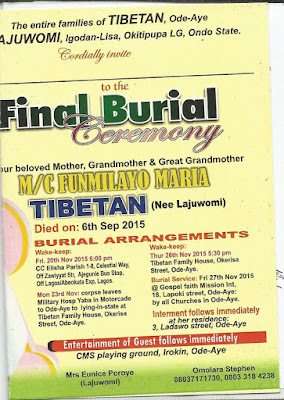 The Late Mother Celestial Maria Oluwafunmilayo Tibetan is survived by her husband Pa Festus Okenola Tibetan 94, a retired Engineer with African Timber and Plywood- Sapele, Delta state, children, grand children and great grand children.